This suggestion is more directed at MC staff / Sebastian, but feel free to add your opinion / view. I'm sure many people, if not most of the active community, are aware of the heated discussions regarding where the player base mainly is. This information is very much vital for how the game can be developed in the future, and tweaked to provide a better experience. At the moment in time, it seems this topic is reaching a peak, and should be 'sorted' to the best extent possible. What I personally propose is that Sebastian (if possible) checks, and records, where in the world the web traffic is coming from on Mission Chief. It could then be recorded, ie. top 5 countries with the most amount of traffic, and how many visitors coming from that country. This could provide a vital turning point in how future updates are based, but also close (or reinforce) arguments such as 'the game is based of the US as that's where most users come from'. If that method isn't possible, when the game is loaded for one time only, a pop up poll appears, which makes users enter which country they are from (and is hence recorded in a similar fashion). The post was edited 1 time, last by Mark_ ( Feb 4th 2019, 5:38pm ). While I agree that we could represent other areas, I do feel that the game benefits from some stability with the influx of ideas through the basing it on America. America offers quite good basis for a game that is quite universal so I don't think we should be changing that, some serious problems would most likely occur if a grand change was implemented, we would see massive upheaval, It's completely unnecessary to ask for such a serious amount of change when most of what is wanted can be replicated through the use of some creativity. Not everything is going to be orientated to what we like, we have to work with what we have at the moment rather than be totally unrealistic with our expectations. We don't need a massive change, just in the future ideas from the UK, Europe, and the rest of the world need to be considered. I agree with Kieran. We do need to see ideas being taken from the UK and Europe as a lot of players are from there as well as the US. I'd like a proper view of the statistics regarding locations. While North American players may be a big factor in how the game is influenced, there should be no reason why their ideas could not be worked around to maybe work with a higher number of people. We call all co-exist in this environment together whilst providing good ideas for North America AND for the rest of the players without compromising playability. The way I see the best way of working for all players no matter what country is to have things in a way which serve multiple purposes or do things in a way that aren’t mandatory. Can you elaborate? For example From what I’ve heard, platforms in the UK are not used NEARLY as much. However, if this was changed, it would drastically affect how things operate in the US. In the UK, platforms are used for building fires etc, but for some reason it is required for the MVA rollover, could someone explain why and what purpose they serve over the pond? That is a difficult one. The fundamental platform aspect is basically the same but the equipment space on the UK one is a lot less so they are only used as platforms nothing else (CARPs being the exception). This to be honest is probably the biggest difference. For example a NA tower could carry MVA equipment but a uk ALP wont (CARP's again being the exception). I have attached two pics just to show the difference. Right, but I recall you saying that almost no one except the major cities has platforms, right? And Bury St Ed's Pump which acts as a usual pump, just with a ladder on,for comparison. What do the USA CARP's look like, as to me at least, the usual platform trucks in the US look like what we class as CARP's over here? And @letsgohope12 , (to my knowledge) all counties in the UK will have at least two platforms (or ALPs as we call them) but major cities like London, Manchester etc. have many. The post was edited 3 times, last by KieranWood ( Feb 4th 2019, 11:13pm ). I would say its probably about one to every 20-30 stations. For example i have attached a picture of how aerial assets are distributed over the east of england per county. The option i see to really sort this out is to have two levels of rescue specialisation. Basic and advanced (Advanced being USAR etc) Ladders will then count as basic rescue requirements for things like collisions etc. This way its not a requirement but a player can send a truck if they want. One thing i would like to see happen, is for the ALP requirement from the MVA rollover to be deducted, or for someone to explain to me why another heavy rescue isn't required instead. Where I'm based... Our platform trucks are used quite often - structure fires obviously, but they also respond to unconfirmed fires/fire alarms within the CBD or surrounding area if it is a rather large structure. Better to have them on scene from the very beginning rather than having to wait for one to turn up! On the other end of the stick - our CAPA's are dispatched to a variety of things - MVA's would be one of those. 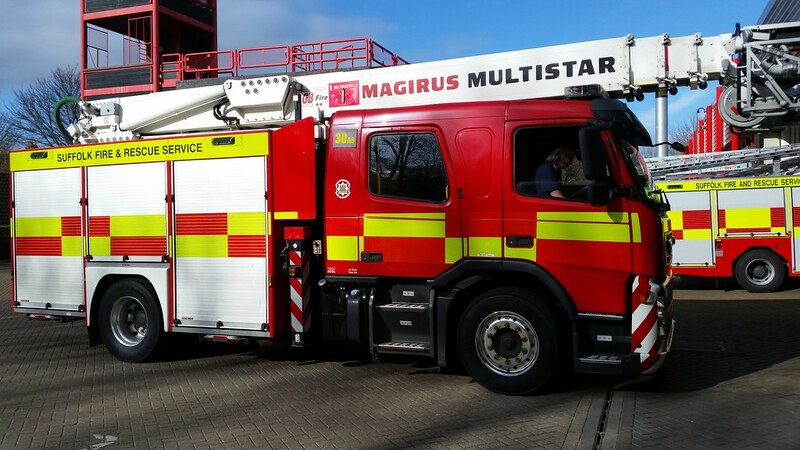 Built by Rosenbauer and the only ones like them in the country, they're pretty much capable of handling anything - from small grass fires to massive warehouse fires. Great assets. CAPA would be a quint. A traditional ladder such as the FDNY's wouldn't carry water or have a pump but would carry RTC equipment. Its such a diverse (But interesting) debate and this is the problem. Do American fire departments have any CAPA/aerial pumper/quint vehicles? It would be nice if there was a place on the forum we could have a completely off topic discussion about each others' emergency services and how they differ, for example, water rescue, platforms etc. Yep. LA County only use quints. its so varied from county to county. Not a bad idea. Honestly this is a productive discussion. From recent topics it is clear that there are people from all around the world on here (Which makes our job more difficult haha). 3 years ago it was easy to say everything had to be based off North America because an overwhelming majority of the player base was from there. Whilst i think its still a majority its not overwhelming anymore. Positive non hostile discussions really help get ideas across and help on balancing the game for all.